Vivid Sydney transforms our favourite city into an illuminated palette of artists and pioneers in light design from all over the world, unlocking the pinnacle of Sydney’s beauty. 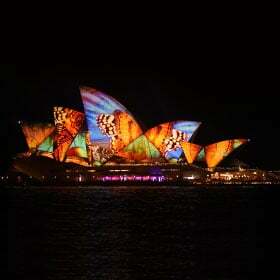 The harbour city comes alive at night with large-scale projections lighting up the sights in all its glory. This Magistic VIP Top Deck Vivid Sydney dinner cruise offers a truly executive premium experience on the private deck of a multi-million dollar catamaran. Over the course of the 23-day duration of the annual Vivid Sydney Festival, these nightly buffet dinner cruises offer unique vantage points to take in the sights that surround. The expansive decks on board allow you to appreciate the beguiling harbour highlights from close quarters. 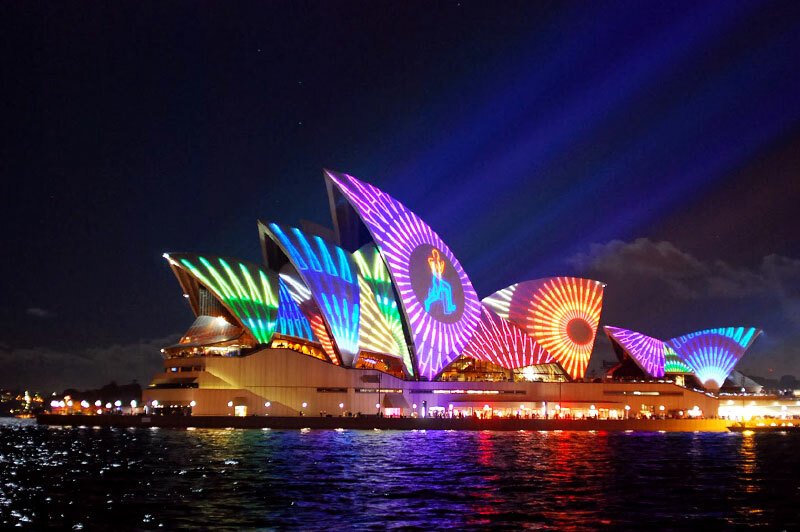 The Lighting of the Sails of Sydney Opera House is, without a doubt, one of the major reasons to consider opting for this cruise. Views like never before call for incredible innumerable photo-ops. 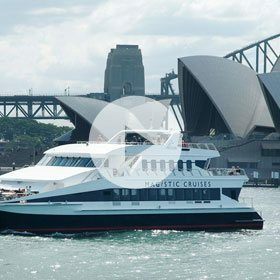 While the reserved table on the private “Business Class” level on the catamaran is promised, this Vivid Sydney cruise also offers a restaurant-quality freshly prepared buffet and beverages throughout the duration of the cruise. This level of the catamaran only caters to a maximum of 50 guests, offering a premium unparalleled Vivid Sydney cruise experience. The absence of overcrowding and the attentive wait-staff ensure that your cruise makes for a memorable evening.
" Thank you for a great evening, looking forward to doing it again. " " Very enjoyable experience. Food was great and no shortage of drink service. Loved how it stopped at circular key so we could experience the vivid lights display which was amazing. Would highly recommend." " Spectacular views of 'Vivid' displays without the crowds. Good company, great staff, very comfortable boat"
" It was a wonderful night & great food. Fantastic staff. Thank you for an awesome Vivid night." " Thanks, had a great. We will recommend and be back." " I would like to thank all the staff, they were very courteous and attentive. The food was great and the fact that the cruise was not overcrowded made it was very comfortable. We really enjoyed the evening and would definitely book with you again"
" Couldn't fault anything will recommend to friends and family!!" " Wonderful experience, all round 100%. Service staff friendly, helpful and exceptional job well done. Will highly recommend to others." " Exceptional cruise in every aspect. We will recommend it to all our family and friends and will come back again. Please keep us up to date with future offers. Thanking you for a great night." " Your crew on board and staff in Darling Harbour were all excellent. What ever you are doing To train your staff keep doing it!!! Thank you for a lovely experience." " All members of my group that night agreed that it was a great night out, despite the 2 hour bus trip each way! We would certainly consider returning next year." " Wonderful experience and great value for money. Thoroughly recommend." " A great experience. We came from NZ to take our daughter in law and granddaughters for a treat and we all thoroughly enjoyed all aspects. The views of Vivid from the harbour were amazing and the 3hours went very quickly. Loved the fact that the boat stopped for a reasonable amount of time in the harbour to allow us plenty of time to view the fantastic lighting on the opera house. Wonderful cruise. " " Thank you. We had a great time. It was a shame about the weather. Not in your control. 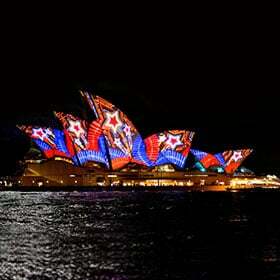 I will definitely book again for Vivid next year." " Had a fantastic time aboard"
" A most enjoyable night . The food and service was great with excellent viewing from our window seats"
" Great night despite the rain. Special mention to the captain who invited us to the wheel house and took the time to explain how the vessel operates." " A lovely experience Great vivid views Food and service top quality"
" A very well operated cruise - staff were friendly and highly efficient. Food was excellent - extensive choices and freshly prepared. The drinks package was also great value! The 3 hours offered stunning views of Sydney Harbour - loved the Circular Quay stop to take in the vibrant atmosphere. Would definitely book again!" " Thank you for an absolutely fantastic experience!!" " Thankyou again for a wonderful night out on beautiful Sydney Harbour! This was our second year on the ‘Vivid Magistic Buffet Dinner Cruise’. My family and I had another most enjoyable evening. The staff were exceptional, there was an excellent selection of food and beverages. On a cold, rainy night we enjoyed the Vivid lights from inside the boat and could pop out on deck for photos. We highly recommend this Cruise and we will definitely be back again next year !" " We have taken a couple of cruises with your company and have always enjoyed them that is why we keep coming back." " Local customer. Been a couple of years ago to view Vivid. Did not disappoint even on a cold rainy night this year. Buffet fantastic, along with service. So pleasing to encounter such polite, well mannered service staff. Will be back again. Thank you." " Being only the two of us it was fabulous to have our own table - it was a fantastic night on the water and the food was spectacular. Thanks to all involved." " We were incredibly happy with the service and the willingness of the crew to individualize the service to our needs. We also were very happy with the booking service that solved a problem of double booking with ease and good humour. " " Most enjoyable evening thank you"
" I will definitely recommend your company we had a great night out, Thank You !" " Excellent time we have enjoyed the cruise will come back for another." " Great night very friendly staff." " The cruise was excellent but the vivid lights are not up to previous standards, we heard that because the lights were being spread to parramatta , chatswood , the zoo , etc , there would not be as much around the harbour , and having seen the lights from land and water i would be inclined to agree with that statement . but the cruise itself was excellent , it was a special event for my husbands 70th birthday and they certainly looked after us . thank you." " Enjoyed the night and the staff were very friendly and good"
" We have been on your Vivid cruise before and were impressed then, so therefore chose your cruise again. We have people in our group ( myself included) who have bad backs and need a reserved seat. A lot of other cruises do not offer reserved seating, so you are way ahead in our choice for that reason, food is lovely with plenty of choice and offering 3 hour cruise is great. My sister lost her purse on your cruise and was so appreciative that it was found with money and cards still inside. Thank you for a wonderful experience. " " We really enjoyed the cruise. Friendly staff made it more enjoyable and food was really good and tasty...two things which can be improved 1 is if customer can get preferences to window seating especially family with kids. And 2nd is in boarding time if family with kids can be priorities first... overall it was very good and value for the money...keep up the good work. Hope to cruise again very soon..."
" Had a very enjoyable night and would highly recommend this company to anyone looking for the same experience. Thank You." " We had a really good time. It was our first Vivid dinner cruise. We will definitely do it again next year probably with you!" " Awesome experience and great night. 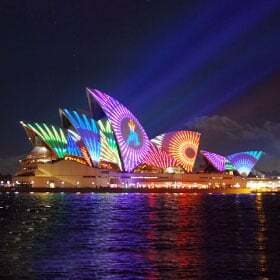 Very keen to lock in next year"
" A very enjoyable night with an extensive range of food and drinks"
The Vivid Sydney Festival is a spectacular annual cultural event that will rock Sydney. 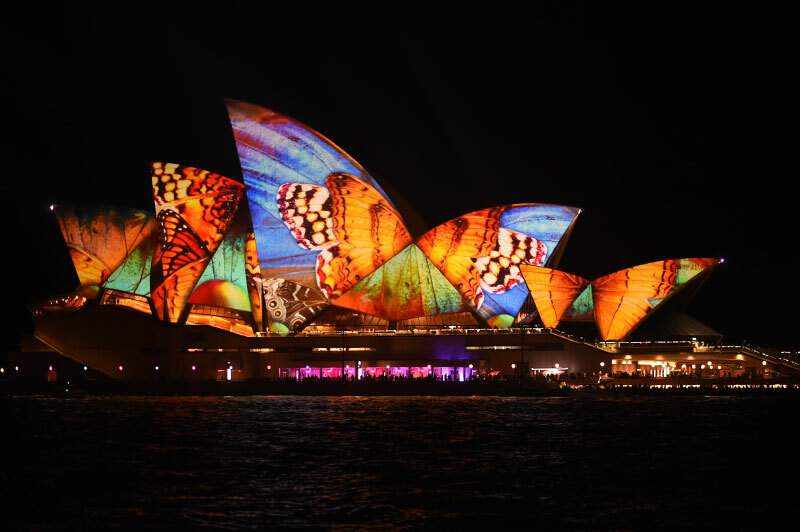 A festival of global magnitude, Vivid Sydney attracts creative minds of the world who swarm to Sydney to be a part of an event that lights up the city with a splash of colour and creativity. 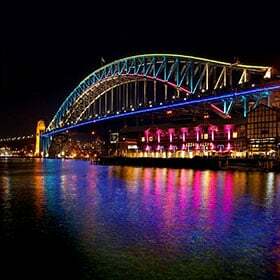 As summer fades into winter, Magistic hosts daily Vivid Sydney Festival dinner cruises for the duration of the event, giving visitors the opportunity to cruise around Sydney Harbour and take in the luminous creativity of the event. The decks of the Magistic afford the best view of the brilliant kaleidoscope of lights and colours that bounce off Sydney’s iconic buildings. 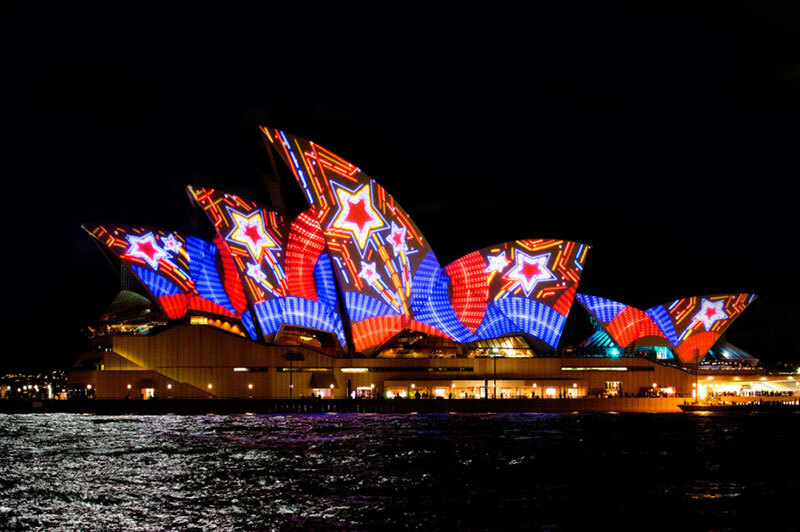 During your Vivid Light Festival cruise, you’ll be amazed to see how the dazzling play of lights and stunning projections bring alive the dormant sails of the Sydney Opera House. As you sip on refreshing drinks and sail around the harbour, you’ll get to see the dancing flames of Campbell’s Cove and the brilliant light art installations of Circular Quay. Magistic offers a deluxe dinner buffet, freshly prepared onboard, with beer, wine and soft drinks included for the duration of the Vivid Sydney cruise. Magistic’s Vivid Cruises are a delight as you are cloaked with luxurious warmth inside and treated to the brilliance of the Vivid Light Festival outside. 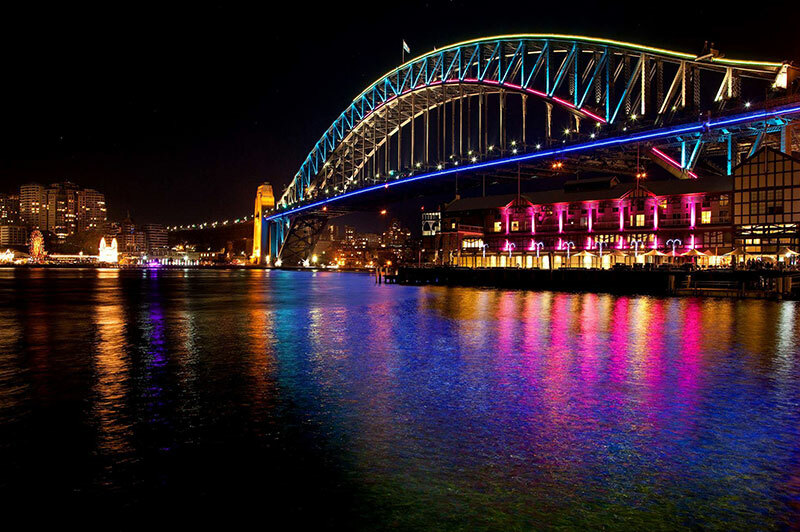 The Sydney Opera House, Circular Quay, the Rocks and Walsh Bay are pivotal precincts of the festival and glow with extravagant lights that portray another face of modern art. Darling Harbour has been widely acclaimed for the Vivid Aquatique, a cutting-edge fountain with illuminated water jets that sail through a magical wall of light. The visual brilliance is enhanced by music that is artistically syncronised to the display. There is never a dull moment during this festival that includes numerous installations brought to life by over a hundred international artists, Vivid music shows, events that showcase the state’s creative industries and motivational speakers who do justice to the coming together of creative minds. The Magistic, along with other cruising vessels and ferries that traverse the harbour, will be illuminated and they change colours as they enter different Vivid precincts. Pick any day during the festival and book your Vivid Sydney dinner cruise well in advance to be assured of a table aboard the Magistic. The Vivid Cruise will not disappoint – there is no better venue for you to capture the essence of this luminous festival that pays a glorious tribute to creativity!